CEG-Lite™ Commercial Epoxy Grout, a lightweight 2-part 100% solids epoxy grout formulated with Custom’s exclusive CustomLite® Technology. CEG-Lite represents a major breakthrough in epoxy technology, delivering the high stain and chemical resistance professionals expect, combined with handling characteristics and versatility that far surpasses other epoxy grouts. 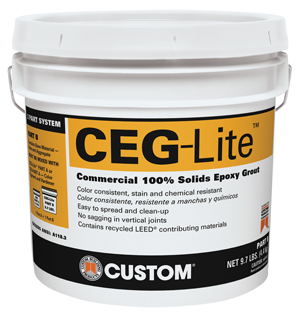 CEG-Lite is formulated with the same recycled content found in Custom’s other lightweight setting materials, making it the first 100 percent solids epoxy grout that contributes to LEED certification based on recycled content, which also affects the handling of the product, giving a smoorther consistency providing increased spread ability. For a full list of our 40 grout colors, use our color selector tool.